The most Amazing Experience of your Lifetime! The view from Africa’s highest bridge captures all the majesty and tranquility of the Bloukrans River valley. But there is nothing tranquil about throwing yourself more than 200 meters down towards the river below. 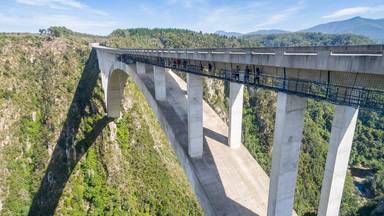 Recognized as the ‘highest bungee from a bridge’ in the world, Bloukrans Bungy uses pendulum bungee technology to ensure the smoothest, most comfortable bungee jump possible. Jumpers are secured in a full-body harness combined with an ankle connection. Just an amazing experience! The staff was very friendly and professional, and they made the experien... - Fouad Diab Maalouf. Book things to do at Bloukrans Bungy. Find the best things to do at Bloukrans Bungy. What people say about Bloukrans Bungy. Just an amazing experience! The staff was very friendly and professional, and they made the experience even more special! Everyone and everything about this experience was great! Loved the whole experience. Felt safe all the time. The staff is so friendly and has a very good vibe. Will be back!